Omnichannel Banking. 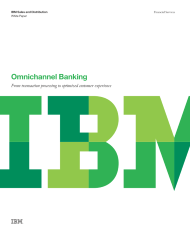 From transaction processing to optimized customer experience. Today’s empowered and enlightened consumers demand services according to their individual preferences whenever, wherever and however they interact requiring bank to have a solid multi-channel infrastructure and an omnichannel experience allowing customers to enjoy seamless, personalized service across every touch point.